First World War centenary, marked at free Bryngarw House event. 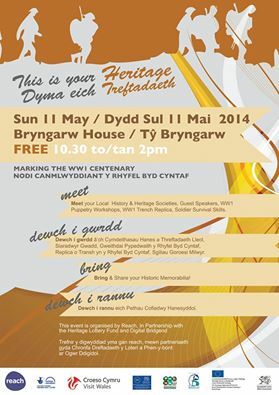 Visitors to Bryngarw House and Country Park were able to step back 100 years for a fascinating glimpse into life during the First World War at a free ‘This is YOUR Heritage’ event on Sunday 11 May between 10:30am and 2pm. The local community arts bus was showing First World War films and audio in a ‘pop-up cinema’, while families took a walk through the park’s woodland for a soldier survival skills demonstration. In a further tribute to the war’s centenary, children enjoyed having the chance to make puppets in a workshop inspired by the ‘War Horse’ stage show. The event has been organised by Bridgend County Borough Council’s Rural Development Programme ‘Reach’, in partnership with the Heritage Lottery Fund and the Digital Bridgend Project. 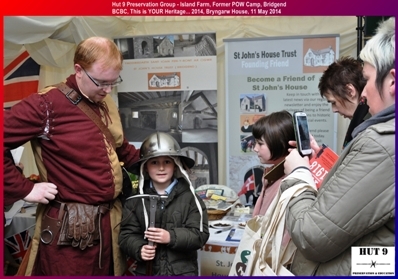 Members of the Hut 9 Preservation Group participated in the Bridgend Heritage Day 2014. Young friends of Hut 9 had their photo taken with our Group's Treasurer Brett Exton, who was in full uniform for the occasion. The day also featured other guest speakers discussing topics such as the role of women during the First World War, Heritage Lottery Funding and Bridgend County Borough Council’s exciting Digital Bridgend project, which will use modern technology to let people download content such as videos and audio guides via their smartphones and tablets when they are visiting some of the county borough’s most historic sites. 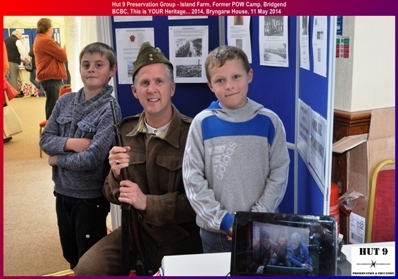 Local historical and heritage groups were displaying their latest projects and exhibitions at the event which delves into Bridgend County Borough’s past. Visitors to the event were fascinated to find plenty of local historical information that has been collated by voluntary groups from Bridgend County Borough’s valleys, villages, towns and coast. Visitors have been encouraged to bring their own heritage photographs and memorabilia to the event if they would like to share it with the public. Staff from the Local and Family History Centre at Ty’r Ardd will also be on hand to give visitors an exclusive preview of the centre’s indexes of the Glamorgan Gazette from the war years, before they are published in September. For further information about ‘This is YOUR Heritage’ events, please email yiota.haralambos@bridgend.gov.uk or visit www.bridgendsheritage.co.uk.